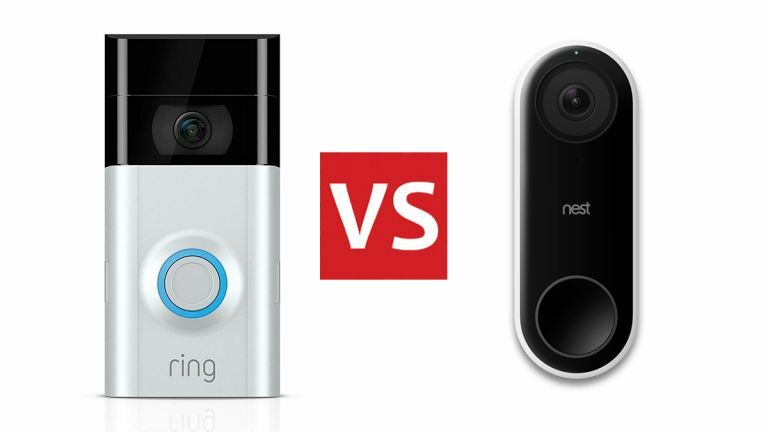 Ring Video Doorbell 2 vs Nest Hello: which is the best smart video doorbell for your home? Should you leave Amazon or Google in charge of your front door? Our homes are getting smarter by the minute, and that extends to the video sentry posted at your front door, too. Two of the best of these devices are the Ring Video Doorbell 2 (from Amazon) and the Nest Hello (from Google), but which one is the right purchase for you? Here we'll compare the Ring Video Doorbell 2 against the Nest Hello in all the key areas that matter—the design, the features, the way they work with other bits of smart home kit, and so on. By the time we're finished, you should be able to make the most informed choice. Both the Ring Video Doorbell 2 and the Nest Hello are made up of two key components: a button and a camera. There are only so many ways to put those bits of kit together, but to our eyes the all black Nest Hello comes across as the slightly more stylish option – but you might prefer the two-tone black and silver (or black and matte black) approach of the Ring Video Doorbell 2. Coming in at 12.83 x 6.35 x 2.74 cm, the Ring Video Doorbell 2 is the bigger of the two – the Nest Hello is 11.7cm x 4.3 cm x 2.6 cm, so won't look quite so obvious on your doorframe. The Ring Video Doorbell 2 is also the more versatile out of these two video doorbell devices, offering either wired or wireless (battery-powered) installation; with the Nest Hello, you have to wire it up. You might also want to take a look at the apps that go along with the Ring Video Doorbell 2 and the Nest Hello – the software design isn't quite as important as the hardware design, but you're going to be using these apps a lot. Both are pleasingly elegant and minimal, and it's hard to split them here. In terms of basic functionality, the Ring Video Doorbell 2 and the Nest Hello match each other – they both show you a video feed of what's happening on your front porch and let you hold a two-way audio conversation, and they both do it well. Both doorbells stream video in clear 1080p resolution, and can alert you when motion is detected in front of the camera, even if no one has pressed the doorbell (handy for spotting people snooping around). Both doorbells have a night vision mode and have the same 160-degree field of view. Let's not forget smart home integration: both the Ring Video Doorbell 2 and the Nest Hello can have video sent to an Amazon Echo Show via Alexa, while the Nest Hello also works with Chromecast and Google Assistant if you want to get the feed up on a big screen. Video from the Nest Hello can also be set up to go to the Google Home Hub instantly. Extra subscription packages are available for both video doorbells. In the case of the Ring Video Doorbell 2, you can pay from £2.50 a month or £25 a year to save clips to the cloud for up to 30 days. For Nest Hello, it's £4 a month or £40 a year to save clips to the cloud for 10 days and to get some very useful additional features. Specifically, you can set up activity zones (so only motion in a certain area alerts your phone) and facial recognition (so the Nest Hello knows instantly who's at the door). It's the same package you get with other Nest cams and it works very well, if you've got the budget to afford it. Both video doorbells can be set up with optional chimes that will make sure you don't miss someone at the door if you don't have your phone with you. Finally, Nest Hello has a useful extra feature called Quiet Time, where your doorbell can be muted for a specific time (while you're asleep, maybe). As you'll be able to see from the points we've raised above, the battle between these two video doorbells is a very close one. Both the Ring Video Doorbell 2 and the Nest Hello offer reliable, intelligent video streaming from your front door straight to your phone. Bear in mind there's also the Ring Video Doorbell Pro – slightly more money for a nicer look and custom motion zones, but it has to be wired. Both the Ring Video Doorbell 2 and the Nest Hello can also alert you to motion, but thanks to Google's superior AI processing, the Nest edges it by distinguishing between people and other moving objects (like dogs or cars). Add a Nest Aware subscription and it gets even better, recognising faces and letting you set up activity zones for motion alerts. Those extra features together with a slightly more aesthetically pleasing design mean we're edging towards the Nest Hello for our top pick, but don't discount the Ring Video Doorbell 2 completely – not least because it's quite a bit cheaper than its rival. The Amazon device also has the option of wireless, battery-powered operation.